Last week I found myself wearing a lot of leopard print. This week it's polka dots! 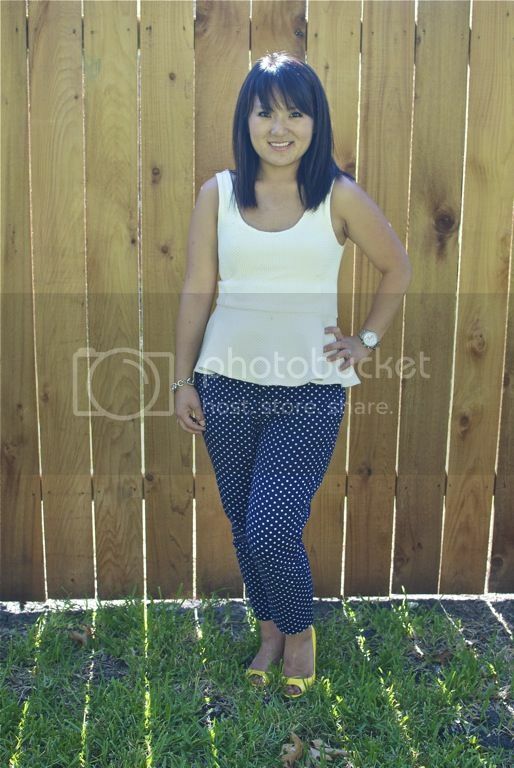 Tara of Mix and Match Fashion wore these pants here and they looked amazing on her. So I decided to order a pair. I actually ordered two. One in a size 2 and one in a size 4. Both in petite lengths. It's very rare that I can find something that I like at Old Navy available in a petite. They arrived last Friday (along with a few other things :-)) and I instantly fell in love with them. The size 4 started out perfect. They weren't too baggy and they were just the perfect length but as the day went on, they started to stretch and now I wish I had kept the size 2. They are 98% cotton and 2% spandex. I guess the 2% was enough to make these things stretch. Stay tuned tomorrow folks for another polka dot ensemble. Hee hee.